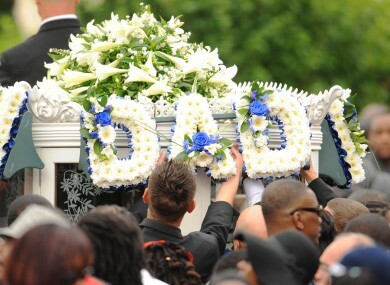 Mourners place flowers on a horse-drawn carriage following the funeral of police shooting victim Mark Duggan at the New Testament Church of God in Wood Green, north London, on 9 September 2011. POLICE IN LONDON have admitted that “it was wrong” not to formally review the so-called ‘hard stop’ tactic used against known criminals and suspects. However, Scotland Yard defended its record on dealing with firearms incidents. In a statement ahead of tonight’s Panorama investigation, entitled Shoot to Kill, the Metropolitan Police Service said that officers “fire shots only once or twice a year”. The enforced stop (or hard stop) is just one tactic used to resolve an operation and arrest criminals, they said. We do many hundreds of these operations a year and it is extremely rare for shots to be fired. This is because of the professionalism, training and restraint of armed officers. “The alternative to using this tactic is to allow highly dangerous criminals who get into cars with guns intent on committing harm to carry out the crime, only investigating it afterwards, with potentially catastrophic consequences for their target. Over the past 10 years, eight people have been killed in pre-planned operations. Two were as a result of an enforced tactic. In 2005, following the shooting of suspected drug dealer Azelle Rodney, the IPCC recommended to the London force that it should formally review the tactic. The watchdog called it a “high risk option”. This was not done, something Scotland Yard now admits was wrong. “However, following the result of the Azelle Rodney enquiry, an interim review has been completed by the College of Policing and the MPS will now work with the College and the national lead to see if there are any alternative or better tactics available in Europe or the rest of the world,” a spokesperson continued. “Firearms operations against the most dangerous and determined armed criminals are of course not straightforward. “We are proud of our success in reducing gun crime in London by taking weapons off the street and putting criminals in prison for long periods. Criticising those who have the responsibility for running such challenging operations is easy. BBC’s Panorama reporters spoke with the unit responsible for killing Mark Duggan in 2011. His death sparked riots across a number of British cities and his family believe he was ‘executed’. One of the officers said he “killed someone because I thought my colleagues and I were about to die”. He added that he would make the same decisions if faced with the situation again. “All the training in the world will not prepare you for dealing with having to kill someone. It’s absolutely horrendous,” added the second officer. Email “Scotland Yard 'wrong' for not reviewing 'shoot to kill' tactic”. Feedback on “Scotland Yard 'wrong' for not reviewing 'shoot to kill' tactic”.